This collection introduces Buddy Baker, a second-rate superhero struggling with real-life issues and moral dilemmas. Buddy is a caring husband, devoted father, animal activist and super-powered being. But as he attempts to live up to all of his roles, he finds that there are no black-and-white situations in life. In these stories, Animal Man is called by S.T.A.R. Labs to investigate a break-in related to an AIDS vaccine, only to learn what inhumane acts are going on. 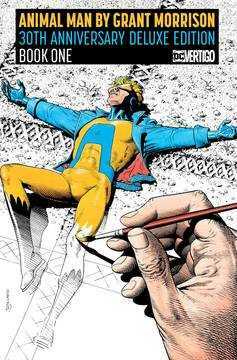 Then, Animal Man is invited to join the Justice League of America, but fears that he may be out of his league. One of the best-loved titles by Grant Morrison, bestselling author of titles including WONDER WOMAN: EARTH ONE, ALL STAR SUPERMAN, BATMAN AND ROBIN, SEVEN SOLDIERS, DOOM PATROL, JLA, THE INVISIBLES, FINAL CRISIS and many more, is repackaged in a new hardcover. Collects ANIMAL MAN #1-10 and a story from SECRET ORIGINS #39..